Poland is becoming a major tourist destination and has attracted visitors in increasing numbers since its severance from the Soviet Union in the late 1980s. It is at the heart of Europe and carries with it characteristics of both Western and Eastern Europe. Since the overthrow of the Communist government, Poland has modernized substantially but much of the country’s history and cultural traditions remain intact. Poland offers tourists old historic cities, medieval castles like the Malbork (the largest in Europe), wild national parks and nature reserves, sweeping coastlines and seaside towns along the Baltic, mountains such as the Tatras, Bieszczady, and the Beskids, limestone areas and caves, and dark forests such as those in the Gorce. Unfortunately, much of Poland’s architecture was destroyed in WWII, but Kraków remained unscathed and visitors can still browse through the well-preserved medieval and Renaissance architecture there. The old town of Zamość also remains a perfect example of a Polish Renaissance town and has been designated as such by UNESCO. Other baroque sites include the Jawor and the Swidnica, both wood churches that have been designated as heritage sites. Gothic architecture can also be observed by visiting the city of Torún. Poland’s natural beauty and landscapes are perhaps the country’s biggest selling points. The countryside throughout Poland is serene and unspoiled – especially untouched is the scene of small-scale traditional and organic farms. There are also many wild national parks in Poland. The Bialowieski National Park in Podlaskie is notable in that it is the only place where you’ll find surviving European bisons. Birdwatchers might enjoy the Ujście Warty National Park and the Biebrza National Park, the latter is home to the greatest number of birds in all of Europe. The Karkonoski National Park is another notable park because you’ll find some of the most gorgeous waterfalls there. And if you are interested in dunes, the Słowiński National Park has some of the biggest dunes in Europe. The top travel destinations in Poland include the capital, Warsaw, Kraków, which is the country’s cultural capital, Gdansk, which is the ancient Baltic port, and Gydnia, which is a Baltic seaside town. Kolobrzeg is also a popular destination. It is a seaside, spa and health resort with numerous historic monuments and entertainment attractions like beer gardens. Kolobrzeg is also a favorite for those who enjoy beach-lying, bird watching, cycling, and horseback riding. 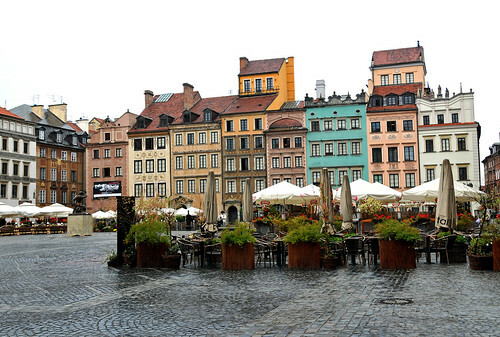 Other worthwhile cities include Poznan, Wroclaw, Gniezno, Bochnia, Zakopane, and Lodz.